The Area Agency on Aging for Southwest Florida oversees government-funded home care and community care services. These long-term services are designed for eligible adults age 60+ and adults with disabilities. These programs allow people to live with dignity and independence in their own homes and communities. In each county, our lead agencies provide and/or coordinate these services. AAASWFL holds these agencies accountable through training and monitoring. Eligibility for these services is determined by the Florida Department of Elder Affairs (DOEA). These services are funded through Federal and state grants. These include the Older Americans Act, National Family Caregiver Support Program, Community Care for the Elderly, Home Care for the Elderly, and Alzheimer’s Disease Initiative programs. Why is Home and Community-Based Care Important? Nursing home care is cost-prohibitive for many seniors. At an average daily rate of $177.00, the annual cost of nursing facility placement is nearly $65,000—and that cost can raise sharply for a semi-private or private room. On the other hand, a typical in-home care plan would cost approximately $17,000 per year. That’s a savings of nearly 75%. 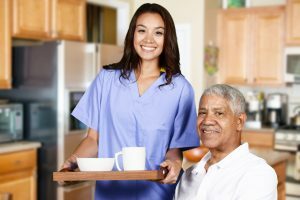 A typical home care plan includes case management, homemaking, personal care, caregiver respite, and home-delivered meals. To be placed on the DOEA’s priority list for these services, start by calling the Elder Helpline at 866-413-5337. The Helpline can also refer you to nonprofit and private-pay options for these services, as well as short-term options.